Does life just happen to you? A man is riding a horse that is galloping very quickly. He seems to be in a hurry — probably heading to an important place. “Where are you going?” a man yells at him. “I don’t know. Ask the horse,” the rider replies. Sometimes, life feels like a horse we cannot control. We don’t know where we are heading or why. We are just running as this Zen parable captures. Most of us are living on autopilot — the horse holds the reins, not us. Who holds the reins of your life? Adults make an average of 35,000 decisions a day. We’ve developed an unconscious decision-making system to manage routines. It prevents us from overloading our brains. However, modern life has hijacked our lives — the mechanism that should protect us is creating social disengagement. When we live on autopilot, it feels like the horse is riding our lives, not us. Our minds wander around most of the time. 96% of people admit making most decisions on autopilot, according to research — it has become an epidemic. Autopilot is becoming our default operating mode — we are sleep-walking into our choices. 39% of respondents say they slip into autopilot while relaxing at home. And two-fifths say they’ve forgotten something while operating on that mode. “People recognize that the choices they are making don’t add up to the life they want to live. We can all do better at living more purposefully. The opposite of autopilot is purposeful living,” explains Dr Mark Williamson. Much of our lives are wasted by doing things mindlessly. Most people can’t remember what they watched on TV — research shows that binge-watching diminishes memory and perceived comprehension. We are living on autopilot in the place where we need to pay the most attention: our home. People make decisions — such as what to eat, what to watch on TV, or what to wear — without putting any thinking, the study concludes. There’s another way to ride. Living on autopilot disengages us from both our present and future. One exercise I love facilitating to help people reconnect with their life’s purpose is the future-self meditation. Participants ‘travel’ to the future to visit themselves 1, 3, 5, and 10 years from now. The goal is to help people visualize their dreams and wishes. Each visit, in a different point in time, helps them visualize the progression but, most importantly, to understand how they overcame their fears and constraints. To my surprise, most people find it hard to project their future — they are so disconnected from the present that they can’t dream. Living on autopilot means leaning towards the most comfortable thinking mode. But we have two; we must learn to use both. Though System 1 and System 2 have been around for quite some time, it was Nobel awardee Professor Daniel Kahneman’s book Thinking, Fast and Slow, that turned them mainstream. 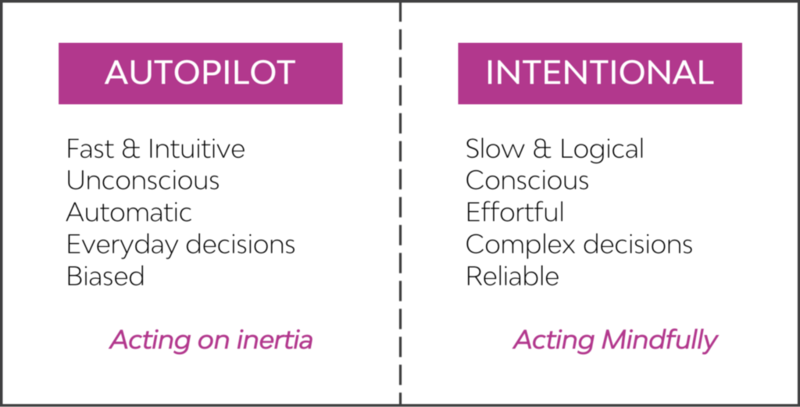 System 1 is an automatic, fast, and unconscious way of thinking — it’s our autopilot. This system is autonomous and efficient, though deceiving too. It’s more prone to bias and to make the same mistakes. System 2 is slow, conscious, and effortful — it requires attention and energy. It’s more reliable and can filter the System 1’s misjudgments. Our brain is lazy, as I wrote here — that’s why it leans towards System 1. Self-awareness helps us train our mind and avoid living on autopilot. It’s not that one is better than the other — we must learn to use those in a balanced way. System 1 is ideal for quick decisions, based on little information. When you are driving your car or doing the laundry, you don’t need to overthink. However, you wouldn’t use it to make more significant life choices like choosing a career, which home to buy or whom to marry. System 2 is ideal for handling more complex mental activities, such as logical reasoning, managing interpersonal relationships, learning new things or building habits. It can help you turn off the autopilot. Your brain has an autopilot mode — it’s called the ‘default mode network.’ This function is perfect for mundane activities such as driving or shopping. To study this brain network, scientist taught participants how to play a new card game. Brain scans showed how memory regions were activated while participants learned to play the game. Once they familiarized with it, the brain ‘switch-off’ and the autopilot region lit up. Participants started to play better, performing more accurately and quickly. Your brain autopilot boosts your performance when it comes to repetitive tasks. However, your life is not a card game — to think through a situation, problem or dilemma requires paying attention. Being more mindful is the answer. But, first, regains the reins of your life. Become more aware of your behavior. Are you living on autopilot because you want to or because it just happens? Are you making choices or merely letting your autopilot choose what shows you watch or the food you eat? Write a journal or take notes to increase awareness and challenge your behavior. Be patient. It takes time to regain the reins of your life. What’s your end destination in life? How do you want to be remembered? As the saying goes, “Choose something worth dying for, and live for it.” Your life’s purpose should guide and inspire your actions. Having a clear destination will help you avoid useless shortcuts. Keeping your purpose present will bring more intention to your everyday activities. There’s nothing wrong with letting the horse ride freely — the problem is when autopilot becomes your driving system of choice. Habits drive focus and efficiency. However, they must be connected to your life’s purpose and goals. Don’t let your routines dictate how you live, bring mindfulness to everyday chores. When you squeeze back on the reins, the horse comes to a halt. A pause is more than slowing down — it’s creating space to start paying attention. You can reflect on your life. What do you like? Are you enjoying what you are doing? What’s going on? Are you focused or distracted? Why? We are prisoners of our busy minds; pausing sets yourself free. When we live on autopilot, we stop challenging ourselves — you end up bored and repeating yourself. Discomfort is a doorway to personal discovery and growth. Learning happens when you stretch beyond your comfort zone. Test your limits. Try new things. Build a habit of continually experiencing new things — you don’t need to skydive to feel alive. For simple things, follow your gut (System 1). However, if your gut is not certain, think it through. Avoid cognitive biases — challenge the first solution that comes to mind. Remember, your lazy brain will jump into the most comfortable conclusion, not the best one. Lastly, for important decisions, always think them through. Sometimes, choosing to drive on autopilot could be an excuse to not paying attention. When you don’t know what’s wrong, you don’t feel the need to make any changes. FEAR is the acronym for Fighting, Excuses, Avoidance, and Repetition — it’s how resistance manifest. The antidote to FEAR is DARE — Discovery, Autonomy, Reframing, and Experimentation. Here’s how. Be authentic. Be brave. Dare to change. Letting life happen to you is easy. But, if your autopilot is always on, you are just existing, not living. Being on autopilot prevents mundane activities from overloading your brain. However, behaving with intentionality and mindfully lets you enjoy life, not just live it. Regain the reins of your life — you decide when to drive on autopilot and when not. Not the horse.